SpeeDx Pty. Ltd. today announced submission of their PlexPCR® RespiVirus test to the Therapeutic Goods Administration (TGA). The company anticipates clearance in time for the Australian 2019 flu season. The test utilises SpeeDx market-leading PlexPCR® multiplex technology, designed for detection of 14 targets representing 10 viral respiratory-illness causing pathogens. 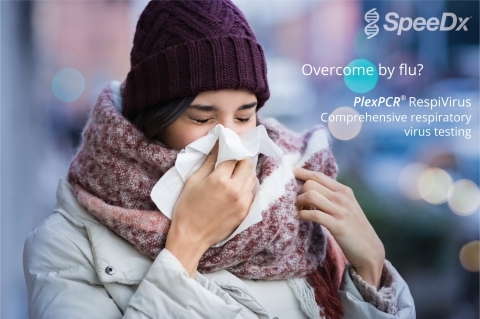 The anticipated addition of PlexPCR RespiVirus will add to SpeeDx’s infectious disease test portfolio that includes PlexPCR® VHS, a multiplex lesion diagnostic test for Herpes Viruses (Type-1 & -2); Varicella Zoster Virus, responsible for causing chicken pox and shingles; and Treponema pallidum, the bacterium that causes syphilis. Other tests in the SpeeDx portfolio specialise in sexually transmitted infections (STIs) and genetic mutations for antibiotic resistance. Tests include ResistancePlus® MG – clinically proven to improve cure rates for patients infected with the STI Mycoplasma genitalium (Mgen) by using antibiotic resistance information included in the test result.3 SpeeDx also markets ResistancePlus® GC (CE-IVD)* - the first commercial test to detect Neisseria gonorrhoeae, the bacterium causing gonorrhoea, and genetic markers for ciprofloxacin susceptibility, enabling doctors to treat patients with an inexpensive and simple oral antibiotic. *not available in the U.S. or A.U. PlexPCR® kits are highly multiplexed qPCR tests for detection of infectious diseases. Powered by proprietary PlexZyme® and PlexPrime® technologies, the product line offers high multiplexing capability for better, more streamlined infectious disease management, and improved laboratory workflow. Australian Government. 2017 Influenza Season in Australia. Information Brief (22 November 2017). Read T R H, et al. CID 68(4): 554-560. Harris AM et al. Annals of Int. Med. 164(6):425-435. Woodhead et al. CMI 2011;17(6):1–24. Harris AM et al. Annals of Internal Medicine 164(6):425-435.